Untold Indy /// Arsenal Game Room /// everyone has a story. 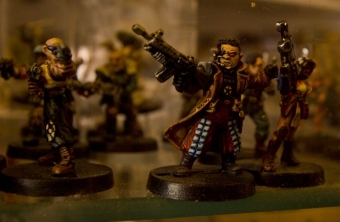 The Arsenal sells a variety of gaming miniatures. 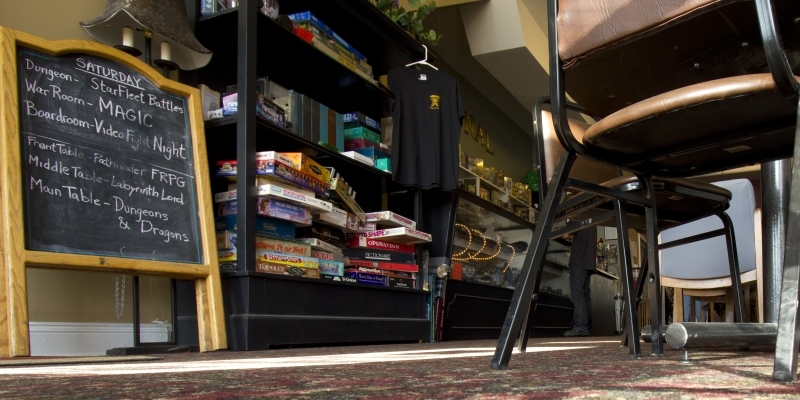 Fountain Square’s Arsenal Game Room and Café is humming with activity.Dice roll, players congratulate each other on a good move, and shouts of victory echo from the basement. The games are varied: to the right, a dozen Backgammon, Chess, Sorry and Clue boards hang invitingly on the wall. The tiles “ARSENAL GAME ROOM” are glued tenaciously to the Scrabble board. On the left wall is a shelf packed full with boxes of Settlers of Catan, Munchkin, and Magic: The Gathering. Dungeons and Dragons miniatures, dice, and figurines overflow display cases along the long glass counter. Down the middle of the café are tables surrounded with people sitting in groups playing games from both sides of the gaming spectrum. Downstairs, some groups of gamers gather in the themed meeting rooms to continue game campaigns that have been going for as long as three years. The Café has been open for almost five years, becoming a staple in the rebirth of the Fountain Square area. A frequent gamer hangout to be sure, but its location near the Cultural Trail on Virginia Avenue makes sure that it sees a decent amount of non-gamer foot traffic, too. 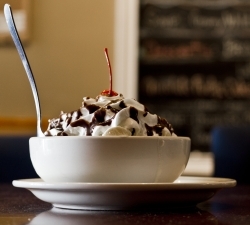 The Brownie Sundae: a scrumptious specialty dessert. The non-gamers are there for the food. Served from the counter in the back of the store, the cuisine is a departure from what you’d expect to find at a gaming establishment. Pizzas, breaded tenderloins, cheeseburgers and nachos, of course, but also daily soup options and brownie sundaes seem to appear out of nowhere. They’re made fresh, not frozen, and culinary inventions like War Dogs (hot dogs topped with barbecue pulled pork and nacho cheese), Nacho Salads (a huge order of nachos with meat and cheese – covered with a salad) and the new Chicken Rations (a meal fit for a soldier) provide a much more varied and interesting menu than one might expect from a place that caters to gamers. Its quality is also a pleasant surprise—the tenderloin is soft, melting in your mouth, and complemented perfectly with the potato salad that recovers memories of a State Fair midway. The War Dogs are at once creamy, savory, and sweet with expertly barbecued pork making you wonder why no one ever put barbecue on a hot dog before. And our brownie sundae was so fantastic that it inspired two more orders on sight alone. The plethora of offerings, both in menu and games, proves the business’ name true: it is a stocked arsenal for gamer geeks. 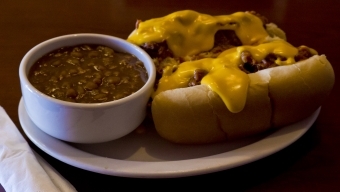 War Dogs are an original Arsenal recipe and possibly our new favorite way to eat hot dogs. Owner Troy Branam and his business partner Andrew Chang make sure it stays that way, for veteran gamers and newbies alike. Branam likes the social atmosphere. “Gamers are much more sociable and acceptable together. It doesn’t matter who you are. The game is the mission.” He opened the place in 2007 to bring gamers together to play. And they did come together – gamers that couldn’t play at home until 3 in the morning, gamers that needed a location other than their basement, gamers that didn’t like the Fritos and Mountain Dew they were stuck with at home. Bill Webb was one of those gamers. He came in to run a game of Dungeons and Dragons in January of 2008 and just never felt like leaving. Now, he helps out with cooking and makes sure that the vision of the Arsenal is well adhered to. He remembers when some gamers came in with an idea for a LAN video game tournament downstairs. At first he had to consider it, but “As long as you can see your opponent, that’s fine,” he eventually replied. “If you can sit across the table or sit next to somebody and interact with them during the game, you can do it here. That’s our only criteria.” The café and its three basement meeting rooms are intended for social play and looking around on a Saturday night will prove their success. This skeleton makes up one piece of the Dungeon Room decor. You won’t find any hazing here; newbies are very welcome at the Arsenal. “One thing about gamers is that they’re eager to teach,” Branam explains. “All the gamers in here like new players, just because it’s all fresh to them. 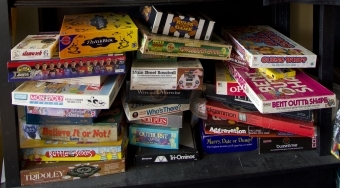 They’re always looking to teach people.” One group meets to play board games on Thursdays at 5pm, and the always-popular “Friday Night Magic” event is a popular Magic: The Gathering event every Friday at 7pm. Webb recommends Mondays and Wednesdays for people wanting to take the plunge into role playing games such as Pathfinder or Dungeons and Dragons. The Arsenal calendar, though, shows open RPG games on Tuesdays through the end of April. The Arsenal Game Room is now and always will be welcoming to all games and all gamers. When are you gonna go?